The Ayecka SR1 is a very versatile device which can be controlled with via a USB connection to a virtual COM port, or via the Telnet protocol to the Management port of the device. These options are described in section 4 of the EUMETSAT Guide. You can also download the terminal emulation program PuTTY and inspect, monitor and change the Ayecka SR 1 that way. PuTTY will work both over the USB connection, and over Telnet from anywhere on your network. The Ayecka SR1 contains two configuration settings, and the EUMETSAT configuration (which should be present on all devices recently supplied by GEO) has configuration 1 set for the DVB-S service and configuration 2 set for the DVB-S2 service. To change, from the main menu, select 1, Configuration. Then select 1 to configure the RX channel 1, then select 1 (for DVB-S) or 2 (for DVB-S2), and enter I (letter i) to change the configuration from Active to Inactive or vice-versa. Please note that when using a configuration file, the network address of the SR1 might be reset to the default, and it is best that you disconnect the network cable while performing this operation. Do the configuration update over USB. If you have customised the network addresses, you may need to reset then after using a full configuration file. Tip: when using the configuration utility be sure to disconnect the antenna and all network cables, otherwise you may get the message Device Blocked. Don't confuse changing the active configuration with the two receivers, RX1 and RX2. You are changing the active configuration and not the receiver. The RX1 input is used at all times, you do not need to swap the antenna cable between the two F connectors! Note that on the reduced price SR1s sold by GEO the RX2 line will absent. Keep pressing the "0" key to refresh the display and watch how the RX1 status line changes. If the link margin is less than 4 dB you may have problems when the weather is bad. You will see different link margins for the Basic Service (8PSK 3/5) and the High Volume Service (16APSK 2/3). Information about SR1 software updates is here. The current software is version 243, so the information above is for beta testers or those with recently purchased boxes. NB: After setting the MODCODs, enter "0" four times to return to the home menu, and then perform a warm restart. Note that if you also require the older DVB-S service, you may need to add the mask for QPSK3/4 as well, making the table read as below. Thanks to Arne van Belle for spotting that one! Information to be confirmed. What is MODCOD? MODCOD stands for MODulation and CODIng. It refers to the density of data packed onto the satellite broadcast signal, and to the strength of error protection coding used. You can find more information in Wikipedia. With the recent solar outage in October 2014 there was a chance to evaluate the best settings for link margin to get the best from this receiver. If the receiver is set for Basic Service reception alone, EUMETSAT are recommending that the link margin be set to Lower: -0.6 dB, upper -0.3 dB, i.e. a 0.3 dB difference. These allow the maximum amount of data through based on EUMETSAT's own measurements. As there may be some variation in receiver performance, and as I like to allow a little margin, I have now set my receivers to -0.8/-0.7 dB. Use the System Menu (option 4), RX Link Margin Thresholds (option G) to check or set these items. If you are using the High Volume Service, EUMETSAT currently recommend the thresholds be set to +0.6/+0.7 dB, i.e. a 0.1 dB difference, although this will also apply to the Basic Service as well thus causing it to stop at a higher margin than is optimum. Selection of different thresholds for the two service types is planned a future release of the SR1 software. I am currently using +0.6/+0.7 dB, the EUMETSAT recommended values. If you are using both the Basic and High-Volume services, you need to use the HVS settings listed above. If you use the BS settings, the receiver will get bad data when the signal falls too low for the HVS, and this may cause unnecessary corruption to attempts to capture the Basic Service data. Important! After setting the new thresholds, be sure to use four "0" to return to the main menu, and then perform a warm reset. From the main menu, "4" is the System menu, and option 1 is Warm Reset. You can keep a record of the Link Margin and other important parameters by using MRTG. Details are here. Should you be using the BDADataEx software, you can also set the MODCOD and there is a single setting controlling the threshold. In the Tuner-Settings panel, look for the Modcode drop-down list. For just the Basic Service, this should be set to 8PSK,3/5 as in the screenshot below. You can also set the limiting Es/No below which decoding of the 16APSK2/3 High Volume Service will not be attempted. Although shown as 9 (dB) in the example below, I think this is a little optimistic and I would suggest a limit of 10 (dB) instead. 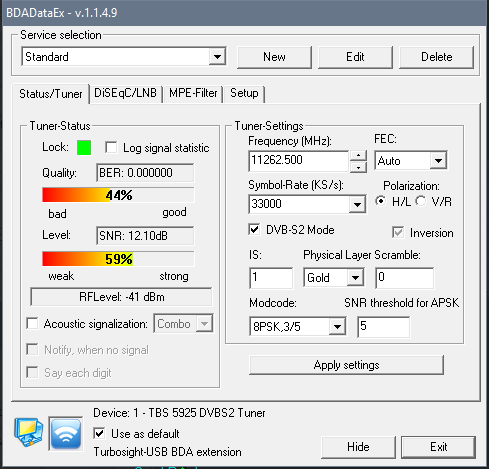 BDADataEx v1.1.2.1240 has the same settings. Some Ayecka SR1 boxes are shipped with the option to switch between the two receiver channels, but this function is not required for EUMETCast and should be disabled. The correct settings for EUMETCast are dual-mode, which disables the channel switching. Enter a number of "0" to get back to the main menu. After configuring HVS, I found that the operation mode must be "Single" for HVS-1 or HVS-2 to work. I recall some discussion about this in the past, but can't now find my notes. If you have one of the limited function SR1s, please note that option 5 is automatically correctly set, and will not be visible in the menu. For aligning the antenna, you may like to use the SR1 Controller program normally supplied on request by Ayecka / Space-Band. GEO have permission to distribute this program, which is now available for download here. Right-click, Unblock the downloaded .zip file. Extract the .jar file from the archive to a directory of your choice such as C:\Tools\Ayecka\, and double-click the .jar file to run. You will need a recent version of Java installed - download Java here. Click the icon at top right to set the IP address of your management port if necessary - it would be 192.168.10.99 in a default GEO or EUMETSAT configuration. Download the SR1 controller program. After downloading the program, right-click, Properties, Unblock the .zip file, and then expand the .zip file into, for example, C:\Tools\Ayecka-SR1\. The software will not work if you don't unzip the file, and may not work if simply expanded to the desktop! In case of difficulties, ask on the MSG-1 Group. Below is a sample of the output from the program. The location was Edinburgh which is not quite in the centre of the 10A footprint, and hence a 125 cm dish was in user, together with a Smart-Electronic Titanium quad LNB and a ~20 m cable run. More recent tests by Arne van Belle have show an Inverto Black Ultra LNB to be the best performer. It is available in single, dual and quad configurations. The "Power" indication is the level at the input to the demodulator, not the RF input to the SR1's F connector. An Es/No of at least 13 dB is recommended for reliable reception of the Basic and High Volume services, but 10 dB would be just enough for the Basic service. It is the Es/No value which matters, not the absolute power level. Very careful adjustment of the skew (rotation) and focus (in-out position) of the LNB is essential for best results, once the dish has been accurately aligned in azimuth and elevation. I checked in August 2018 to see whether there was a newer version, but the Ayecka Web page simply had email infor@ayecka.com for more information. However, I did find a github version here which also includes a MIB listing. Need help? Ask on the MSG-1 self-help group or consult one of the sources listed here.